The Chinese believe that 8/8/8 is a lucky day and I would have to agree. First, I had the day off and was going with Marie, aka Czech Chick, to the Mt Baker Lodge for the weekend. Second, the forecast for the weekend was not so bright but on Friday at noon when we arrived in Glacier, it was still beautiful and sunny. Third, we were able to find a decent parking spot near the trailhead to Yellow Aster Butte and (bonus!) there was t.p. in the outhouse. 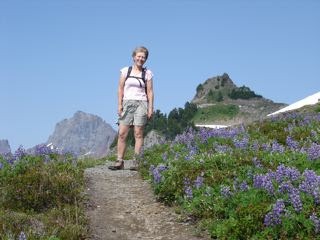 On the trail up to Yellow Aster Butte, the wildflowers started early. 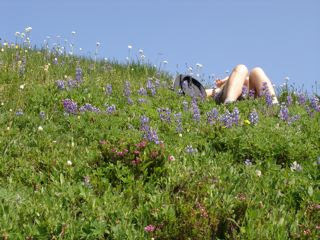 From the parking lot, there was Lupine, then Fireweed along the open slopes. 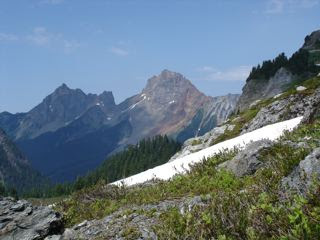 At the two mile mark, we broke out into meadows with babbling brooks and started to traverse alongside the mountain, with Mt Baker in view, in all its glaciated splendor. Then there were the flowers: Magenta Paintbrush, Indian Paintbrush, Penstemen, a lone patch of Mountain Anemone (try to say that with a peanut-butter pretzel in your mouth), Mountain Daisies (what Yellow Aster Butte was mistakenly named for) and dozens of others. On the way up the steep trail to the Butte, we came across a young coyote who was standing on a snow patch and barking, presumably at one of the dogs down below in the campspots. By the time I got my camera out he had gotten wind of us and had moved further away. 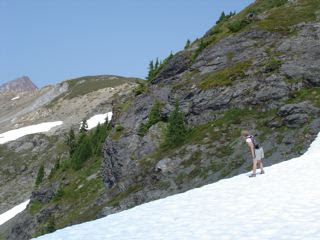 He is visible in the photo just beyond the snow patch, then he stood on the rocky outcropping and continued to bark. There is a magic about hiking (or cycling) with Marie, in that you are nearly guaranteed to see wildlife in one form or another. She was concerned about the young coyote's welfare and walked out onto the snow to check out the situation. Convinced he had a den nearby, she returned to the trail and we continued up. 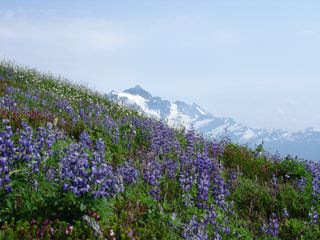 At this point, Shuksan was also in view, as were more and more fields of flowers. We both lingered in the flowers, taking in the colors and views toward both of the big peaks. Marie lay down in them and soon was overcome with bliss. Getting in touch with my inner coyote, I felt the desire to roll in the flowers, but instead just walked out into them, knelt down and composed more photos (no need to crush them). On the hike out, we encoutered many people who were going to be spending the night amongst all that beauty, many of them coming from nearby Bellingham. How lucky they are to have all that in their backyard! For more photos of this hike, go here.